Hanshew, Adam, head-of-household, age 29, born in West Virginia; parents born in West Virginia; first married at age 22; owned farm; occupation: farmer, truck farm; not a war veteran. Hanshew, Reva, wife, age 25, born in West Virginia; parents born in West Virginia; first married at age 18. Hanshew, Harold, son, age 5, born in West Virginia; parents born in West Virginia. Hanshew, Delbert, son, age 3, born in West Virginia; parents born in West Virginia. Hanshew, Melvin, son, age 6 months, born in West Virginia; parents born in West Virginia. Hanshew, Adam E, head-of-household, age 39, born in West Virginia; completed 5th grade; on Apr 1 1935 was living in the same house; owned farm ($1000 value); occupation: coal loader, mining; worked 44 weeks in 1939; $1500 wages in 1939, plus other income. 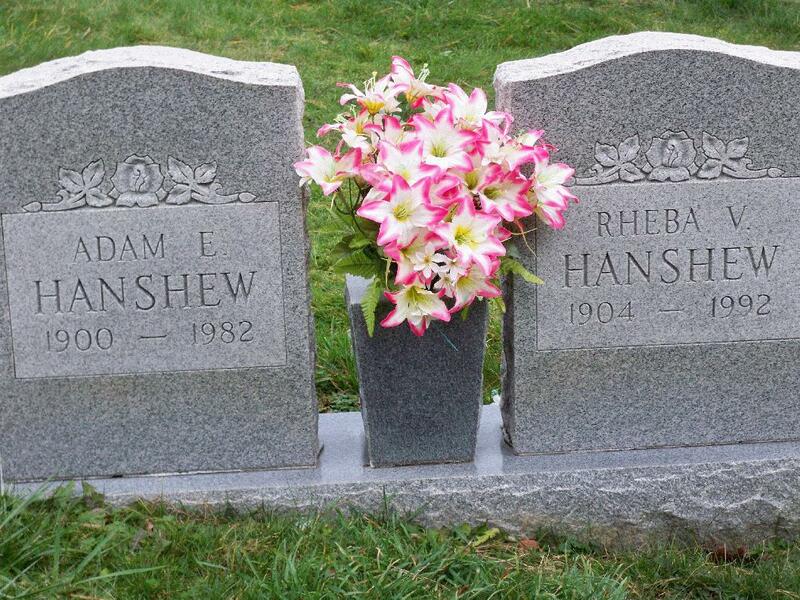 Hanshew, Rheba V, wife, age 35, born in West Virginia; completed 6th grade; on Apr 1 1935 was living in the same house. Hanshew, Harold W, son, age 15, born in West Virginia; completed 1 years of high school; on Apr 1 1935 was living in the same house; attended school. Hanshew, Delbert E, son, age 13, born in West Virginia; completed 7th grade; on Apr 1 1935 was living in the same house; attended school. Hanshew, Melvin R, son, age 11, born in West Virginia; completed 5th grade; on Apr 1 1935 was living in the same house; attended school. Hanshew, Ada M, daughter, age 8, born in West Virginia; completed 2nd grade; on Apr 1 1935 was living in the same house; attended school. Hanshew, Violet L, daughter, age 1, born in West Virginia. West Virginia, Births Index, 1853-1969; http://www.ancestrt.com. 1930 census, Quinnimont District, Fayette County, West Virginia; roll T626-2532, ED 32, page 6A, line #25, dwelling #103, family #106. 1940 census, Springdale, Quinnimont District, Fayette County, West Virginia; roll T627-4402, ED 10-42, page 12A, line #31, household #183. Ancestry Family Tree data "McGuire Family Tree" posted by "rachel_erin4". 1910 census, Quinnimont District, Fayette County, West Virginia; roll T624-1680, ED 25, page 5A, line #22, dwelling #79, family #79. 1920 census, Quinnimont District, Fayette County, West Virginia; roll T625-1948, ED 40, page 2A, line #10, dwelling #19, family #19. Contribution from Jeanne Harrah (). 1930 census, Quinnimont District, Fayette County, West Virginia; roll T626-2532, ED 32, page 5B-6A, line #100, dwelling #100, family #101.